At South Lake Tahoe plane crash, a 67-year-old man killed and his wife who was injured as what local investigators are now trying to find out what led to the plane’s broken wings, according to report by The Examiner. Steven Lefton was killed during the severe collision while his wife Karen Lefton is now treated in the hospital for her injuries. She was trapped under the plane’s debris, and has been rescued by emergency teams. El Dorado County Sheriff's Office spokesman, Lt. Pete Van Arnum said, "Several witnesses at the airport saw it take off and start banking and losing altitude," he added, "It had difficulty getting lift." Steven Lefton has 20 years of experience as pilot. The couple was flying together in the single-engine plane and some witnesses said that was quickly losing altitude soon after take-off. 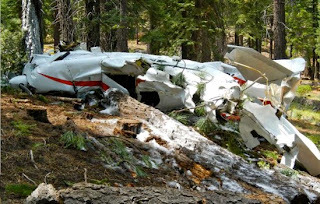 Comments or suggestions about "67-year-old Man killed in Tahoe plane crash" is important to us, you may share it by using the comment box below.